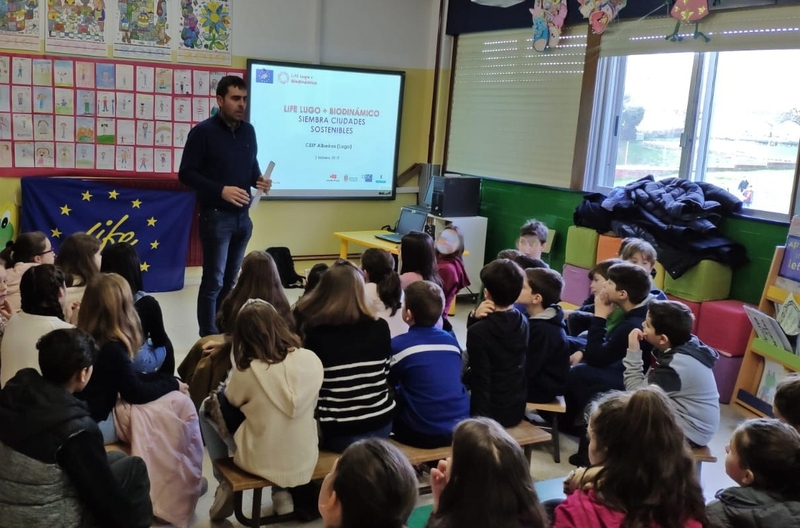 The Foro Verde continues to develop the project LIFE Lugo + Biodinámico among the smallest neighbours of Lugo, thanks to the activities programmed in collaboration with the primary education centers of the city. These appointments, which started with the World Wetlands Day, began on February 7th with an informative activity at the CEIP Albeiros that brought together more than 50 5th grade students and aroused their interest in the development of the actions the project is carrying out around their school. – On March 21, we will visit the plantations with the NGO ACCEM and we will plant a tree in the ENIL for the Day of the Tree. The Foro Verde will continue to expand the dates to publicize the project. If you want to know them all, you can consult our calendar or subscribe to our newsletter and be aware of everything that happens in LIFE Lugo + Biodinámico.